It is more important than ever to confront individual bias and build empathy so all people can contribute and thrive, particularly in order to build inclusive workplaces. First-person storytelling facilitates understanding and empathy more effectively than facts alone. In this session, you will learn about the innovative storytelling work of Green Card Voices, a nonprofit that records and shares the stories of immigrants. You will learn how effective storytelling educates and empowers both the teller and the audience, and will leave with resources and ideas to incorporate storytelling into your work. The session will include presentation from the four panelists, and facilitated storytelling activity with the Story Stitch card game! Learn how to use storytelling as a powerful educational and empowerment tool. Engage with fellow participants in deep empathy building through the Story Stitch card game. Incorporate basic storytelling resources such as the card game, books, and exhibits, into the workplace in order to build bridges between different communities. 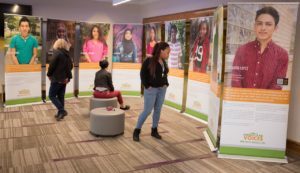 Experience the Green Card Voices Banner Exhibit! Green Card Voices banner exhibit will be on display at during the event. The exhibit includes portraits of immigrants, their 200-word bio, a quote with a QR code viewers can scan to watch a first-person video story. In 2013, Green Card Voices produced its first touring photo exhibit “Immigrants Telling Their Life Stories” as part of its mission to share immigrant stories with as many people as possible. The exhibit featuring 20 Twin Cities’ immigrants has traveled to over 35 locations throughout Minnesota and has since evolved to meet high demand. Diversity Insights Breakfasts are eligible for HRCI and SHRM continuing education credits. Please contact Ben Rue for details. This event will be video recorded and photographed.